As some of you may know, I’m a scientist. If I’m honest, more like Peter Venkman than Stephen Hawking, but a scientist nonetheless. Whilst knowing things about the universe is pretty groovy, with this great responsibility comes the inevitable burden of encountering people who are, even being generous, morons. Not because they’re horrible or mean, but because they believe in fairy stories, magic, homeopathy being an effective remedy for their trench foot and the existence of ghosts. Admittedly, if ghosts did exist, that would be pretty cool, but as it stands, a few dodgy photos of a fuzzy figure in bad lighting and various testimonies of swamp-dwelling hicks claiming they saw something scary in a conveniently spooky place is hardly compelling evidence. And this leads me to psychics – or cold reading con-artists as they’re better known. It may be coming across that I’m a little cynical. You’d be right. My disdain for this bunch of charlatans is quite high – although not quite as high as the incredulity I feel for the dumb saps that fall for their rhetoric. That being said, it does provide a source of material for games which Libellud appear to have jumped all over to produce Mysterium. A game about ghosts and psychics, which you’d be forgiven for thinking I’d not be a fan of, given the last two paragraphs of vitriolic diatribe thrown in their general direction. It turns out that the entire basis for Mysterium lies in the paranormal and spiritual world so I approached the game with one eyebrow permanently raised. 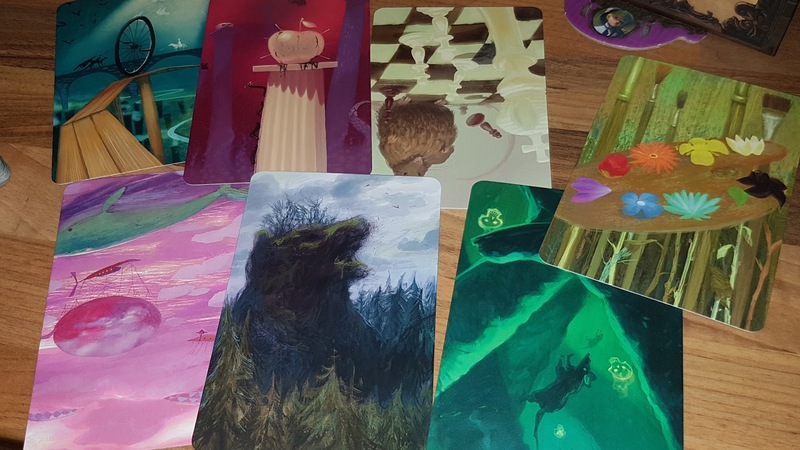 My brow began to relax a little on seeing the box art – it’s whimsical and captivating, two words which start to describe Mysterium rather well. It actually reminded me of the Professor Layton games in a way (mostly the car on the box) which I enjoyed. So Mysterium began to entice me in. The premise is actually quite familiar for anyone who’s played Cluedo (who hasn’t?) in that there’s been a murder and the players are there to try to work out Whodunnit. “What’s so special about that?” I hear you ask (I have good hearing). The interesting twist in Mysterium is that one of you plays the victim. Not as a corpse because, let’s be honest, that’d be less interesting than listening to Nigel Mansell talking about his train spotting diaries, but rather as the Ghost of the victim. 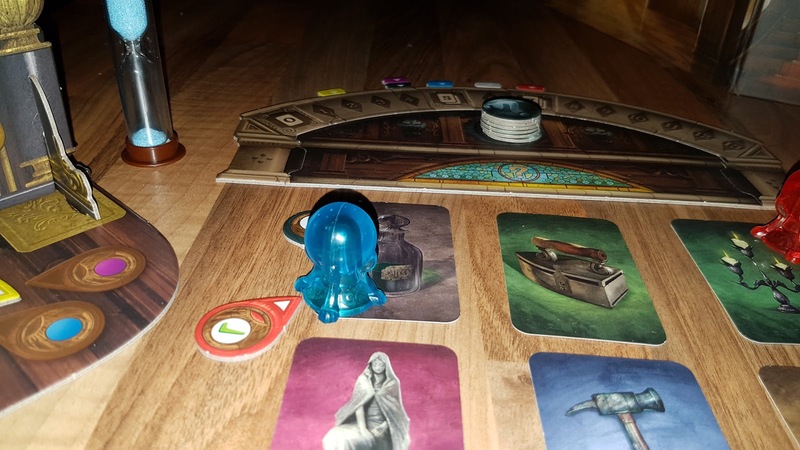 The rest of your motley crew play as various flavours of psychic medium, trying to interpret what crazy yarn the Ghost is trying to spin to give them a shove through the door of unreasonable deduction. Mysterium is set on the night of Samhain for reasons most likely to provide a suitably enigmatic setting. To win the game, the Mediums (Media?) must deduce the Killer, the weapon and the location of the murder in 7 hours (game turns) or they must return again next year to have another crack of the whip. The Mediums try to interpret what the Ghost is telling them through the use of images on cards to point them in the direction of the correct answer. Mysterium supports 2-7 players, one of whom has to be the mute spirit. So, if you’ve got a mate who can’t keep their flapping cake-socket shut for more than 20 seconds, you may want to mention that playing the Ghost perhaps isn’t for them. Mysterium is gorgeous. I mean, really stunning. The artwork is incredible, especially the pictures on the Ghost cards. If I’m honest, I have to question what kind of substance the artist was under the influence of when they drew a lot of them, but whatever it was, it must have been pretty strong. All the cards in the game are beautifully drawn as are the supporting items like player tokens, voting counters, suspect, weapon and location cards and so on. There’s even a broken clock to indicate the game turn. It’s all very thematic and well thought out. To get the muddled message across to the dumbfounded psychics, the Ghost has a deck of these psychedelic cards to play, some of which he lays in front of each player in turn. The idea being that the cards somehow relate to the piece of the puzzle they happen to be on at the time. This of course leads to the fun part of the game – trying to figure out what in blazes the seemingly drunk Ghost is trying to convey, more often than not resulting in a lot of “WTF?” moments. Getting it right is relieving, but sometimes still just as perplexing. During the vision process, players can have a conflab to help understand the gibberish chucked at them by the floundering poltergeist who usually makes less sense than a Geordie visiting the Cotswolds. If players think that either their colleagues are onto something or that they’re less accurate than a gun fired by a hypothermic Stevie Wonder, they can support that claim with a voting counter – if the vote was correct, they receive Clairvoyancy points which helps in the final part of the game. Once an item is solved, the player moves to the next item in order – Suspect, Location then Weapon. There are 7 turns, so spend more than two turns on an item and it puts pressure on you for later items. Each player has a different set of items so they should get to the endgame with an individual set of three cards. If players get to the endgame before the clock runs out, they participate in a vote to determine the actual killer from the shortlist of those who made the cut. The Ghost again puts down cards, but this time is limited to any Clairvoyancy points the Mediums got. More points mean they can see more cards. After careful consideration, they each vote on who, where and what the ultimate solution is. Get it right and the spirit rests easy. Get it wrong and you get an exasperated Ghost, wondering why the Sam Heck the stupid Psychics couldn’t make the obvious links. 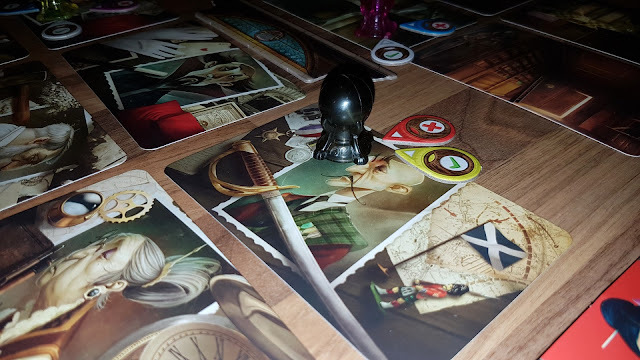 So, despite the unscientific basis, Mysterium is a very well made, polished, and fun game. It takes less than an hour to play so it’s even ideal for the more casual board gamers or for younger kids and families. All the right notes are struck and you’ll come back to it time again for more head scratching, probable swearing and “muh? !” moments. 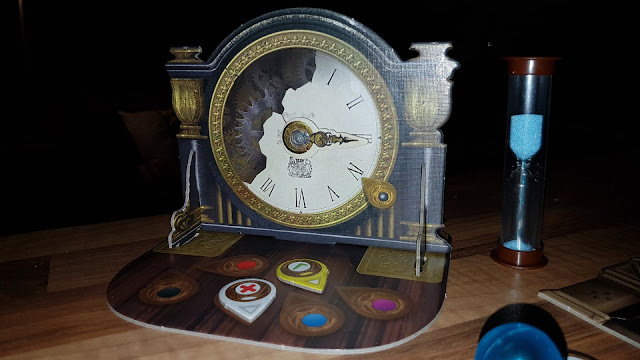 It’s extremely difficult to find fault with Mysterium (believe me, I’ve tried) so if you haven’t already gone out and got it, I’d suggest you do so. Turn down the lights, find a flea-bitten black moggy, slip into a 70s silk bath robe and try to pass as a psychic. Failing that, chuck on a bedsheet and pretend to be a ghost. Either way, you ought to have a lot of fun, although the neighbours may wonder what’s happened to Tiddles.